Most mic bundles economise on their included models, but Audix's BandPack series features some of their leading designs. With all the microphones available for live performance today, musicians and engineers have their work cut out trying to sort through a smorgasbord of different models for that club gig, concert or live recording. Or they could buy a bundled set of microphones that are well matched, come with the proper mounts and are easy to transport in a handy, rugged carrying case. The Audix BandPack Pro is just such a mic bundle, and with some of the company's flagship mics included, it can reward you with that 'just right' sound. As a reviewer, I am well acquainted with Audix, and I own a number of their mics, including the SCX25A 'lollipop' condensers (my favorite dreadnought guitar recording mic) and the versatile i5 dynamic, which forms part of this bundle. The BandPack Pro comes in two flavours: the five-mic BP5 Pro ($775£522), or the seven-mic BP7 Pro reviewed here. The five-mic pack features Audix's OM5 vocal dynamic mic, two hypercardioid OM2 vocal mics, one i5, and a single Audix D6, one of the best kick-drum mics on the market. The seven-mic BP7 Pro kit adds two extra i5s, allowing for increased coverage of a drum kit, or keyboards and guitars. The mics are housed in a sturdy aluminium carrying case, along with appropriate Audix mic clips. The BP5 Pro sports four MC1 dynamic clips and one D-clip for the D6. The BP7 Pro packs two extra MC1 clips for the additional i5s. An informative sheet with specs and suggested use instructions is included, though the print is kind of small, at least for my ageing eyes. Audix provide more detailed info about the mics, as well as mic-placement hints, on their web site. The i5 is a versatile all-rounder, similar in nature to the Shure SM57. Since its introduction in 2004, I have always been a fan of the i5, because its audible character is a bit more 'present' in the top end than an SM57, with a 4dB boost from 5-6 kHz, making it useful not only for electric guitar cabinets and amps, but acoustic guitar and other acoustic instruments, keyboards and drum overheads too. Audix also recommend the i5 for brass instruments, such as trumpet and saxophone. The i5 uses Audix's VLM Type B mic element, and has a 50Hz-16kHz frequency response (with a 9dB rise from 1.5kHz-5.5kHz), and a maximum SPL rating of 140dB. Sensitivity is 1.6mV/Pa (at 1kHz), and the cardioid pattern's off-axis rejection is greater than 23dB. The OM2 handheld vocal mic has a similar element to the i5, but with a hypercardioid pattern design, which gives it a couple of dB more off-axis rejection. It also has a slightly higher sensitivity, and its mid-range and top-end response is not as hot as the i5 (about 4dB less rise at 5kHz), making it sound warmer and more focused. Like the i5, it can handle 140dB SPL. The popular OM5 vocal mic is built with Audix's VLM Type C hypercardioid dynamic element, and offers a more extended (48Hz-19kHz) response than the OM2, with a gradual rise of 5dB from 5kHz to 10kHz, and ultimately a 12dB rise at 12kHz, before the response starts to drop. Its sensitivity is listed as 1.6mV/Pa, off-axis rejection is 30dB, and it can handle a whopping 144dB SPL. A favourite kick-drum and bass-cabinet microphone for many musicians and engineers, the D6 is a cardioid dynamic that is designed with the company's VLM E-type element. It boasts an extended bass response to 30Hz, but its frequency response falls 9dB between 100Hz and 6kHz, before rising back to an even higher peak at 5kHz and dropping off quickly above 15kHz. This allows it to produce a tight, fast, authoritative kick-drum sound without any spongy, boomy signature. Sensitivity is listed as 2.4mV/Pa, off-axis rejection is greater than 20dB, and it can handle massive levels (in excess of 145dB) without distorting. When bought separately, it is also offered in a brushed-aluminum finish, which looks really cool. I tried out each mic on various instruments, and recorded the tracks through a TC Electronic Studio Konnekt Firewire interface with my MacBook Pro. I tested vocals and spoken-word readings with the OM2 and the OM5 handheld mics, and I used the i5s on a Fender Twin Reverb, playing a Fender Strat with custom pickups and a Les Paul Studio with Seymour Duncan Seth Lover pickups. The i5s were also used to record a Martin J40 acoustic guitar in stereo, as well as two powered speakers driven by a Nord Electro 3 keyboard in Hammond B3 organ and Steinway piano modes. I used a Yamaha drum set to test the D6 kit and two i5s for overheads. Although microphones have their intended scope of use, I always like to experiment by trying mics on secondary instruments. You never know what kind of sound you will get, and I have used many a drum mic on electric guitar amps, depending on the sound I was looking for. I ended up using the D6 to record an old Ibanez Roadstar II with edgy-sounding single-coil pickups, where the D6 tamed the slightly harsh sound of the guitar. First, I tried an i5 on the guitar amp. With its broad presence rise, this model gives a nice boost to the high end, but without being too bright or brittle, even when I was using my Strat. It has plenty of bass for guitar and keyboards, but without the narrow mid-range peak of an SM57. It's also versatile enough to relay the rich mid-range character and warm bottom of my Martin without undue exaggeration. This is one of my favourite dynamic mics for instrument recording. I used two i5s on the Nord keyboard, which I amplified with a Class-A amp connected to a pair of Lipinski L505 speakers. The i5s were good enough on the top end to allow the Steinway piano upper-register sounds to get through, and they added just enough shimmer to the Hammond B3, in Leslie mode, to project that vintage organ tone. The Lipinski loudspeakers helped as well. For those who like to use a '57-style mic on vocals, the i5 is a little shorter and not quite as easy to get your hands around as the venerable Shure, but I think it sounds good. Testing this mic kit reminded me of how versatile the i5 is. The OM2 dynamic is a sleeper of a vocal mic. It is warm, balanced and rejects off-axis sound really well, while handling noise is minimal. With a more reserved presence response, it is not as punchy in the mid-range and treble as the OM5 or other mics in its class, but that's why I like it: it's not harsh on any kind of sound. I even tried it on a bright Fender Jaguar through the Twin Reverb, and I loved the sound! The OM5 is great lead-vocal microphone in the vein of the classic American handhelds. It allows the vocalist to really pop through in a mix, even with a voice that is low and dark in character. The mic has excellent off-axis rejection to ensure feedback-free and focused vocal performance without interference from other instruments. It also has low handling noise and is very robust in its build quality. In fact, every Audix mic I have ever used has always been indestructible, even after regular heavy use. On kick drum, the D6 is a premium mic that matches or surpasses any competitor on the market. It's also great for bass cabinets, and if you experiment you can use it on other instruments as well. With the mic placed a couple of inches from a tom, the sound is deep and tight, exhibiting the immediacy that you want from a quality drum mic. The response tailoring in the lower mid-range makes this one of the cleanest kick-drum mics, and allows it to shine on electric bass as well. On playback of the recorded kick tracks, the lows of the kick (around 40Hz) really came through my subwoofer. I even used the D6 on my Fender Twin with the Ibanez and an overdrive pedal creating a cool, hyper-overdriven, buzzy tone. The D6 gave the fuzz tone more weight, while its scooped mid-range character reduced the natural harshness of the single coil. The BandPack's accessories are a nice touch. 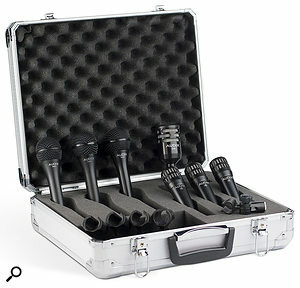 The case is robust and holds the microphones tightly, and you get Audix's standard mic clips for each mic. The clips all worked fine, and the MC1 clip's adjustable screw allows you to dial in the right amount of tension. Audix also offer various optional accessories, including the D-Vice spring-loaded snare drum clip, the Stand KD kick-drum mic stand, and CBL20 and CBL25 XLR cables. I do wish that the optional cables were included in the BandPack Pro microphone sets. Two 25-foot cables and three or five 20-footers in a carrying bag, say, would make it entirely complete as a bundle. The cables might add a little cost, but it would be worth it to be able to have it all right there in the box. The BP7 Pro is a smart bundle of microphones — high-end models, too, not a set of cheapies. The OM5, D6 and i5 are three of my favourite dynamics, and the OM2 isn't a slouch either. Throw in a nice case, and the appropriate mic clips and you've got yourself a good starter or expert kit for small bands, trios, duos and solo acts. All in all, it's a wise choice if you're in the market for a packaged microphone set. Although there are numerous dynamic drum-microphone bundles at various price ranges, the BandPack Pro kits are fairly unique, in that they include mics for vocals and instruments too, providing more of a complete band mic set. Bundle includes Audix's top vocal, kick drum mics. A little pricer than many mic bundles. The Audix BP7 is a cut above many bundled dynamic drum-mic packages, and includes mics that work well with keyboards and guitar cabinets, as well as vocals and drums. Audix +1 503 682 6933.